Then I found it. Finally. Yesterday. Last night in particular. Disguised as a paper clip. And the somebody who took it even painted the hair pin with a liquid pen eraser. Wonder who the culprit is! Hahaha. I love my boys! They can be so naughty and creative. They keep me sane! I am tired but decided to read some posts, and my o my. It was maddening to look for something as small as a hair clip and then to think it is gone, and then someone sneaky used it cleverly. Hihi. Boys can really be so naughty and yes- clever- in repurposing things. It’s so funny to see that someone reused it like that. And why not, it works. Thank God you stopped searching for it, but found it anyways! Funny blog post. Sometimes the simplest things is life are the funniest. Yes, learning new things everyday esp when im with my boys. Hahahah! Galing galing naman, para daw di mo mapansin! Hahahah. Di ko nga masyado napansin at namukhaan. Hahaha. Hahaha… For a while I thought this was going to be a deep reflection. Lo and behold. 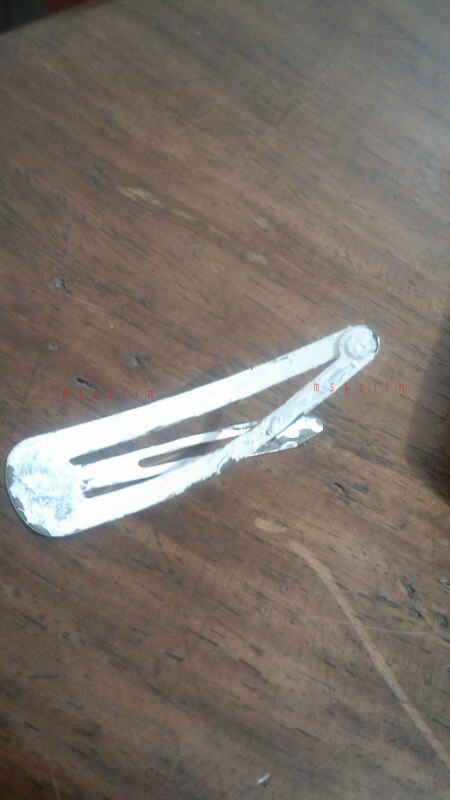 Who thought of painting that hair clip with a white marker and use it as a paper clip? Good job by the way! 🙂 It worked! Haha. My 12-year old can sometimes be so ow creative and naughty or practical perhaps without the intention of hurting my feelings. This is indeed really amusing. 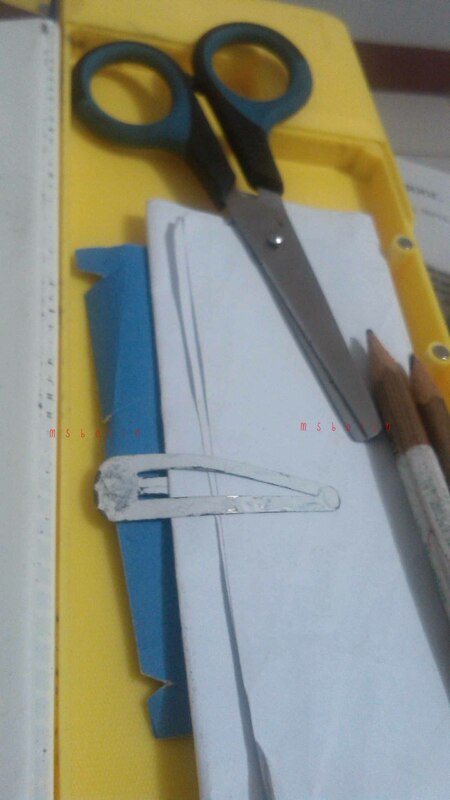 Who would have thought that the hair clip has been turned to a paper clip? Your son is good for being resourceful and creative. I wonder how you informed your son that the hair clip was yours to begin with and it isn’t a paper clip. Hahaha! This is so funny. Fortunately for me, I’ve already been able to train my son to ask me first before borrowing any of my things. So, when I’m missing something I know it’s my fault and not his. Haha! Ahhaha. Good training. i should do the same then. I am dying! That is the cutest/funniest thing I have seen! I can see my little boys finding my barrette and using it as a paper clip. It just makes me laugh so hard though that they painted it with white out, too! Hilarious! Ahahaa. When I also saw mine, I just laughed. Hahaa. Maybe the ants got interested or you have any pets? Haha! These clever boys though… Repurposing a hair clip into a paper clip? Why not? This just shows how creative these boys are! Hahaa. I hope they would not explore too much as they might repurpose all my things into something. Using it as a paperclip is well, kinda cute, but to paint it white with liquid paper is hilarious, hahaha! I have to give it to them, so resourceful at an early age. Haha. Perhaps he finds black too plain and ordinary thus the liquid paper thing. Ihihi. Hahaha! I find this funny. Your kids are indeed very brilliant. Thank you. And i hope they retain the humor and resourcefulness/ creative. hahaha, OMG natawa ako. I can relate sa pagiging makakalimutin. Haha. Forgetful mommies na tayo. Haaha. Im guilty of that, too – my memory. Hahaha, I guess so, too. This is super funny! I can’t wait to have these moments. So far, my missing things are usually found in the compartment of his toy car. When I ask him where his things are, he’d bring me where it is. Ahh, kids! Hahaah. Kids can be darlings without even trying hard. I’m also quite forgetful at times, and my son helps me find my lost items. Now you know where to find yours. Lol! Ihihi. Yes. I just need to look at their things anc knick knack boxes. Haha! That’s funny! Last week I was trying to find my lipstick and I knew I found it when I saw my 2-year old son’s face smudged with red all over his face! hahaha… I think that’s what happens when we have children at home. Here at home, naglalakad ang mga gamit. palipat-lipat ng lugar. Hahahaha. Ang cute! Parang may sariling paa lang sila. Hahaha. Can I just say, your kids are super resourceful? Haha! Sobrang funny and they even painted it white! Yes, the liquid eraser painting just saved him from his mama’s anger. Hehe. Lol.